The Chemistry Courtyard is one of several recently-created areas in the Northeast Campus District that have transformed the section once referred to as the "industrial heartland" of campus. The Courtyard was created by the completion of a new wing and features ornamental trees, shrubs, flowers, and the perfect lawn for an impromptu outdoor class or lunch. It replaces a parking lot that once served as an unsightly shortcut. Reclaiming this space is a crucial step in the University's efforts to be a better environmental steward. The National Wildlife Federation recognized the University with a "Campus Greening through Stewardship Award" for this and other completed green projects from the Facilities Master Plan. The original concept of the garden was to provide a place of gathering, while representing aspects of the sciences of chemistry and biology in design and plant material selection. Over the years, the original landscape design was adapted and modified to suit the site conditions, but is preserved in the circular beds and sinuous paths. Chemistry Courtyard is rectangular in shape and surrounded by buildings on all four sides, with an open-air entrance on Stadium Drive. It has the protected feeling of a cloister, with an arcade on the East side, a lush green center lawn, curving brick walkways, and a patio with seating outside the Atrium on the West side. The views of the courtyard from the buildings are very calming. This calm feeling is enhanced through the use of a variety of plant material, including native and exotic trees, shrubs, and perennials. A dozen pink-flowering sargent cherry trees (Prunus sargentii‘Columnaris’) form a circle in the northwest corner, backed by a dozen columnar junipers (Juniperus chinensis ‘Hetzii Columnaris’). Five purple-flowering redbud trees (Cercis canadensis and Cercis reniformis ‘Oklahoma’) shade the patio, along with one specimen Japanese maple tree (Acer palmatum var. dissectum ‘Crimson Queen’). Three river birch trees (Betula nigra ‘Heritage’) provide organic contrast against the sharp buildings. Large understory plants include crape myrtles (Lagerstroemia indica ‘Natchez’), hollies (Ilex cornuta ‘Rotunda’ and Ilex verticillata), cherry laurels (Prunus laurocerasus ‘Otto Luyken’), sweet box (Sarcococca hookeriana var. humilis), azaleas (Rhododendron ‘Gumpo Pink’), summersweet (Clethra alnifolia), bluebeard (Caryopteris x clandonensis), gold thread falsecypress (Chamaecyparis pisifera‘Filifera aurea’), forsythia (Forsythia suspensa), fothergilla (Fothergilla gardenii ‘Mt. Airy’), red-twigged dogwood (Cornus alba‘Argenteo marginata’), and oakleaf hydrangea (Hydrangea quercifolia). A wide variety of perennials provide color in all seasons, including heaths (Erica x darlyensis), lavenders (Lavandula angustifolia ‘Munstead’), ferns (Athyrium felix-femina‘Frizelliae’), hostas (Hosta ‘Francee’), bleedinghearts (Dicentra‘Alba’), daylilies (Hemerocallis x hybrida ‘Stello De Oro’), silver mound (Artemesia schmidtiana ‘Silver Mound’), and black-eyed susans (Rudbeckia fulgida ‘Goldstrum’). 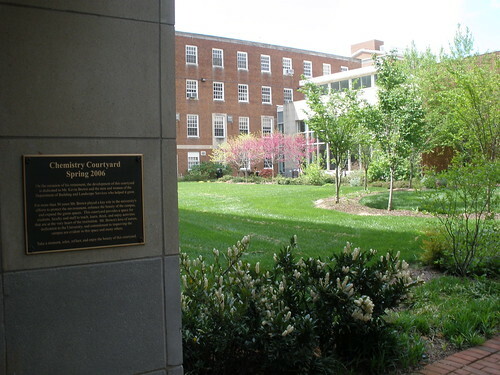 In 2006, the Chemistry Courtyard was dedicated to Kevin Brown upon his retirement from the University. Kevin spent 30 years at Maryland, leaving as the assistant director of landscape services. During the dedication ceremony, university administrators talked about Kevin’s genuine love of the outdoors and how it translated into environmentally sound and beautiful results on the campus.